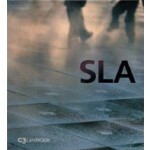 Founded by the architect Stig L. Andersson in 1994, SLA is a landscape architecture and urban development office based in Denmark. This volume in the C3 Landscape series features a total of 28 projects undertaken by the office are examined, through photographs, plans, diagrams, computer images and texts. Through their projects, SLA seeks to combine artistic vision with democratic processes, in an effort to provide solutions that reflect scientific understanding of how physics, geography, climate and resources interact with the human experience of space. This volume in the C3 Landscape series features a total of 28 projects undertaken by SLA are examined, through photographs, plans, diagrams, computer images and texts.